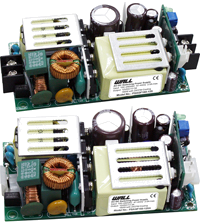 The PSAQF160 series of AC/DC switching power supplies provides 100 Watts of output power with free air convection and 160 watts with 25CFM fan in an ultra compact 4.0” x 2.0” open frame package. This series consists of 12V, 15V, 24V, and 48VDC single output models with a universal input voltage range of 90-264VAC (120~370VDC). Some features include up to 91.5% high efficiency, 0.95 at 230VAC. This series is also protected against short circuit, over power, over voltage, and over temperature conditions. The PSAQF160 series is RoHS compliant and meets EN55022 Class B requirements. Notes: 1. Terminal block I/O connectors are standard; for Molex series 8673 I/O connectors please add the suffix “A” to the model number (Ex: PSAQF160-12SA). 2. Ripple & Noise are measured at 20MHz bandwidth and with 0.1µF and 47µF capacitors in parallel across the output. 3. Output Power: 100W max. with convection cooling and 160W max. with 25CFM forced air cooling.